So this is the last post on the Eclipse Earthquake simulator. I have no plans to create the simulator (but before I drop the idea all together) I thought I’d use a little Psuedo science to make my own earth quake prediction for the July 22 2009 Eclipse. What is the relationship between an earthquake and an eclipse? One normally thinks of a solar eclipse as merely the moon blocking the light of the sun. What one misses with this concept, is that these are two celestial bodies that have a large gravitation pull on the earth. During an eclipse these two bodies combine gravitational forces in exactly one straight line. This means that the gravitational pull of the sun and the moon on the earth are combined during the eclipse. The eclipse quake theory is as follows; When the gravitational force of the sun and moon are both pulling together they create larger than normal tidal forces. The solar tide is about one third the size of the lunar tide. When these tidal forces work together they provide a larger than normal downward push on a subducted tectonic plate. 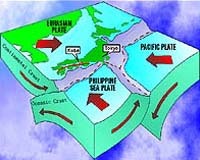 If the gravitation distortion and tidal forces pass over the joint between two tectonic plates that has not had series of recent earthquakes, the extra gravitational pull, and tidal force push is all that is needed to “pop the seam” and cause a major quake. Molten magma beneath the surface of the earth plays a role too. Because the earth rotates faster than the moon’s orbit, this magma tide as well as the ocean tide is often actually directly in front of the moon’s path. Matching eclipse data from NASA to earthquake data from the USGS demonstrates a great deal of correlative data between eclipses and an earthquakes. *** Note: 07/07/2009 Update: Historical data has changed my prediction to be a few hours before the total eclipse, with a window of 8 days after the eclipse. I predict a 6+ Magnitude Quake on July 22 2009 at 3:00PM Local Japanese time. This will be followed by two level 5+ Earthquakes and a Tsunami between 5:00PM and 7:00PM. The tsunami will start out in the pacific ocean (to the South East of Japan … Along the fault line) and hit all the islands to the south west of Japan, Indonesia and even reach Papua New Guinea. The major quakes will actually be along the fault lines in the Ocean. Most of the quake activity will be south of Japan. Taiwan and Indonesia will probably be hit hard too. Note: I have absolutely no credibility to do this. I’m just applying the theory that the gravitational pull of the Sun and Moon pulling together will do the following things. 3. Cause an underground molten magma tide to dip and raise the plates following the water tide. I placed all the time data from the Nasa eclipse site into an excel spread sheet four the four tectonic plates in the region. I assumed an hour delay for each event following the lunar eclipse, and then summed the values. I assumed that the events would last longer for the fluids, water and molten magma than for dry land. I then summed the values four all 4 plates where Japan sits. Just about every eclipse in the past 10 years in Japan has a significant earthquake associated with it. I prefer data within a few hours of the eclipse, but if I open the time window to a few days after, the correlation jumps to 85%. Only one eclipse in this region in 2003 did not have a corresponding quake during the past decade. For Japan, over the past decade or so, 6 out of 7 eclipses with corresponding earthquakes with in a few days (or hours) is a significant fact. I think a real simulator to test the theory would be a great benefit. I think the TGEA properly applied with a physics engine could do it. Who knows what the real values are, but its a fun idea to play with. We start with scientific data gathered from March 1988 where we have Earthquake with a few hours of a Total Solar Eclipse. This historical data matches nearly perfectly the exact location of my current Earthquake prediction. As seen above a magnitude 5+ earthquake occurred 6 hours before the total solar eclipse in Japan, March 1988. Its not just Japan that gets the quakes with a Total Solar Eclipse. China has a recent history too. There is a chance they will get a quake as well, but not as high a chance as Japan. The interesting thing to note is that there does seem to be a significant correlation between Total Solar Eclipses and Earthquakes in this region over the past decade. A magnitude 6+ earthquake occurred 6 hours before the total solar eclipse in China, October 1995. A magnitude 5+ earthquake occurred 1 hour before the total solar eclipse in China, August 2008.